So the Parisians may eat them for breakfast, but we Sydneysiders enjoy our croissants any time of day. The perfect croissant should be made from devilish loads of butter, pounded into layers of pastry dough, and folded over and over to achieve those luscious layers. 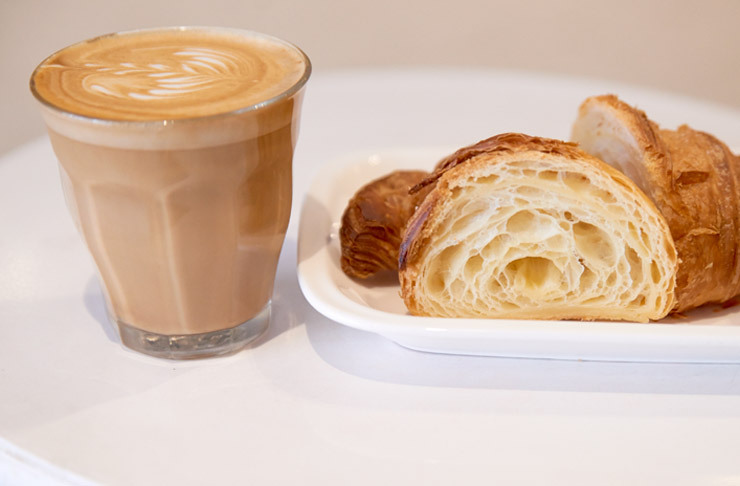 Hit up these Sydney bakeries and cafés for the best in croissant devouring. It sounds so much sexier when you can call it a croissant au beurre. This patisserie, established in 1974, has its roots firmly planted in French pastry-craft, and their croissants are proof of this. They’re generously buttery and gorgeously flaky, and if you’re strategic, order ahead and eat a whole dozen, all to yourself. They don’t skimp on the chocolate in the chocolate and pistachio roulade either. The croissant spiral is filled with Valrhona dark chocolate and pistachios. Tip: it goes really well with their Little Marionette coffee. There’s a 90% chance that everyone in the queue is waiting for their slice of watermelon cake action. But let the words of your kindergarten teacher echo in your subconscious – if they jumped off a bridge, would you do it too? No, you wouldn’t, and for your efforts, you’ll be rewarded with a damn fine flaky croissant from Black Star Pastry. It’s just the right size of croissant goodness. Labelling them ‘butter croissants’ may seem a little over-the-top. But one bite of these bad boys from one of Sydney’s best CBD cafes, and you’ll be glad you were warned. These are incredibly indulgent, pillowy crescents, and miles away from the dry and generic varieties of other CBD cafes. Treat yourself to a sugar-dusted almond croissant too – it’s like eating a dream. It’s hard not too swoon at the colourful delicacies on offer at this Glebe shopfront. Fruity, eclairey, and meringuey treats cover every available surface of the cabinet display, and your hardest decision will be picking the right treat. Take our advice and go for the almond croissants. They look like sleeping armadillos, with an armour of gently-roasted flaked almonds covering an incredibly fine croissant interior, and sprinkled with just the right amount of icing sugar. Fun fact #1: this bakery was the first business in NSW to install solar-powered air conditioning. Fun fact #2: their croissants are delicious. The ones here are of the cocoon-shaped variety, and are pretty delightful. Coeliacs needn’t miss out – Brioche have a spelt croissant on offer, as well as their wide range of other gluten-free breads and pastries. The Royal Easter Show taste testers mean serious business when it comes to their baked treats. Fortunately, it’s not just Country Women’s Associations around the country that get all the glory. Brasserie Bread’s croissants have been bestowed the silver award for a few years running, which explains all that flaky pastry goodness. They’re open seven days a week, but you’ve still gotta be quick to nab these delicious croissants. This bakery just off the main drag of Newtown has a stellar reputation for its baked goods. Their ham and cheese croissant ain’t no regular thang, filled with sliced (not shaved!) leg ham, and a smooth asiago cheese. When toasted, the rich pastry melts with the saltiness of the ham and the subtle bite of the cheese. Beautiful stuff, Luxe.